Recognizing herself in a photo taken more than 60 years ago when she was a 10-year-old camper at 4-H summer camp brings thoughtful reflection of Patricia “Pat” Maberry’s life of hard work and perseverance. The 74-year-old Beaverton resident is a woman from simple beginnings. It was Pat’s grandmother – Lucille Knight – who arranged for the young girl to attend the 1953 4-H summer school at Oregon State College. Pat says that it was during the camp that she made the decision that she’d attend college. It was Lucille that became her cheerleader with her family, who was less than thrilled with the decision. Lucille Knight was a true entrepreneur who was recognized with several community service awards. She instilled a confidence in the young women she worked with and led in her 4-H clubs. Lucille’s preserve company, Knight’s Ranch Home Kitchen, was living proof of that. 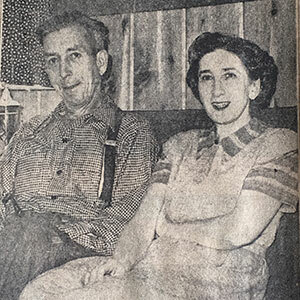 After World War I ended, Lucille and her husband, Otto, moved from Los Angeles to Grants Pass. “They bought a tar-paper shack,” Pat recalls. 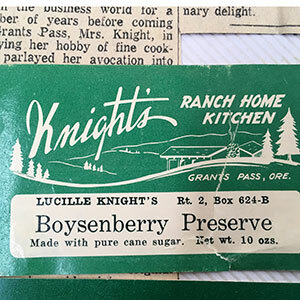 What the property did have was the acreage to grow berries and Lucille, who was a test cook for Betty Crocker, began making and packing her own jams. She made her own labels, pamphlets and shipped them all over the world. Pat recalls that her grandparents weren’t just hard workers, but they had big hearts as well. They regularly fed homeless who knocked on their door on the way to the coastline. Lucille would fix them something to eat and Otto would have them help him cut wood. College wasn’t an easy endeavor for Pat. She struggled with dyslexia, unbeknownst to her until much later in life. She arrived at Oregon State University in the early 1960s and says her freshmen year was a disaster, ending in academic probation. Determined to survive, the home economics major worked hard and spent countless hours studying in the library. She lived in co-operative housing and was expected to do chores, maintain her grades and stay out of trouble. She also worked hard to finance her education and was fortunate to find a job she worked at ever summer, alongs with jobs on campus. What Pat did excel in was social skills and the power of face-to-face networking. When she was a sophomore, OSU held its annual career fair. Since the fair was only for seniors, Pat lurked in the hallways and waited patiently until the recruiter was finished for the day before presenting herself. “I told him I wanted to be a retail buyer but I didn’t have very good grades and just wanted to share my intent,” she reflects. The following year, she lurked in the hallway again. This time, she was invited in and was told she needed to raise her grades and gain some practical experience. She did just that, taking a summer job in Portland. When she returned the next year – invited this time – he took one look at her and told her they didn’t need to talk. He instructed her to be in San Francisco on June 20 to start the training program. Pat’s steadfast determination paid off during her college years. After completing her training in San Francisco, she accepted a job with the Emporium, where she worked for the next year. As fate would have it, the same recruiter from OSU had just started as the head of personal at Meier & Frank (which would eventually become Macy’s) in Portland, and brought Pat onboard. Her work was never dull. On her first buying trip of her career, her boss had a heart attack and her assistance called and told her she was resigning to attend law school. Pat was later was involved with what became the Juniors line of clothing when it first hit the market in 1969-70. Eventually, Pat shifted gears and spent the remaining years of her career in human resources. While she was working for Fred Meyer, she became a part of the company’s corporate recruiting division. She was able to secure money to sponsor interns from OSU and other colleges in Washington and Oregon. She eventually went on to work for Clackamas County, until she retired in 2008. Pat jokes that she’d been listening to people’s problems since high school, so going into human resources finally allowed her to be paid for her ear. In the midst of her career, Pat’s mother gifted her a pedigree puppy for her birthday. The breeder was hesitant to sell it to her and left four pages of typewritten instructions. One of those was that the puppy only be taken to Dr. Matthew Maberry at the Portland Zoo. Pat says that when she called to arrange the puppy’s shots, she talked to a rude and abrupt man – who turned out to be Dr. Maberry. Dr. Maberry was a well-known veterinarian who delivered Packy, the first-ever captive elephant born in an American zoo. He eventually recruited Pat to volunteer at the zoo because he recognized her love of animals. “I didn’t do it for him, I did it for the animals,” she says. Eventually, she saw through his abrupt manner and the two started dating and married in 1975. They enjoyed many years of travel, adventure and living in the spotlight regarding Matthew’s care of Packy. Matthew fell ill in 2005 when he was diagnosed with congestive heart failure. Pat took family medical leave to care for her husband at home. She asked Matthew if there was anything he had left to do and he said he wanted to write a book about his life with Packy. Pat contacted a writer who’d written articles about Matthew and Packy and asked for her help. 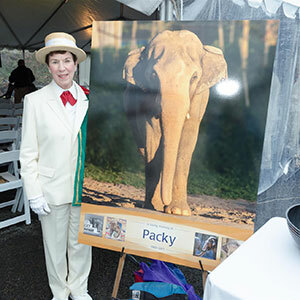 Together, they wrote “Packy and Me: The Incredible Tale of Doc Maberry and the Baby Elephant Who Made History.” Pat created Maberry Press to publish the book. Matthew and Packy’s story was revealed to the world in 2011, a few months before Matthew’s passing at age 94. These days, Pat keeps busy with the Royal Rosarians, serving on the Council as Lord High Chamberlain. She is also involved with the Oregon Zoo, stays involved with politics and current events and contributes time and finances to several community and educational needs. She is still involved with OSU, and served on a fashion advisory committee for 13 years in the 1990s-2000s.